If your computer faces any DNS related issues, one of the major Ping error code you may receive while ping to any domain name is Ping request could not find host [website Name]. Please check the name and try again. This error message says your computer could not find the domain name because it failed to resolve the hostname to IP address. This DNS issue blocks your computer from accessing any domain names by typing the website addresses on the browser. In the below image you can see I tried to ping Google.com but failed to get a reply from the Google server. Instead of getting a reply from the host, I received the error message "Ping request could not find host Google.com. Please check the name and try again". However, when I ping to a specific IP address (Here I used Global DNS address), ping request successfully received the reply. So we can confirm the issue is with the DNS server configured in the computer. In order to verify it, if you know the IP address of any website, type that IP address on the address bar of browser and press enter. The same website will load in your browser. How to Fix DNS Issues in your Computer? To fix any DNS server issues in a computer, follow the steps below. One solution to fix DNS issues your computer is to flush current DNS server address detailed stored. To remove stored DNS details, follow the steps below. 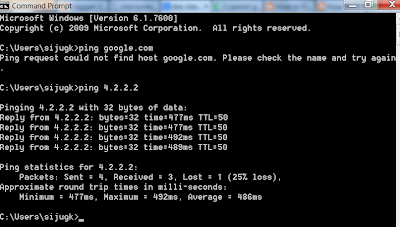 Now try to ping Google.com and check whether you get the error message "Ping request could not find host Google.com. Please check the name and try again". To fix the DNS issues in your computer we need to assign correct DNS addresses in your computer. To do this follow the steps provided in the link below. To find the fastest DNS Server for your computer, click on the link below. If you get any DNS error while accessing the modem setup page, follow the link below. "Ping Request Could not Find Host. Please Check the Name and Try again" and when by ip adress it show timed out..please any one give me a solution..
Have you done flush DNS on your computer ? Yes i have done it but it gives me same result. Hi Prince since your computer is not able to make proper reply while ping both domain name and IP address. It shows there is a connection error. Thanks , changing DNS address fixed the host finding problem from my computer. Thanks for share your kind information. Have you tried the command "ipconfig /flushdns" on command prompt?